It’s the end of August, and you have just sent your daughter off to start her journey of independence and self-discovery. If her university has sorority chapters, you may be hearing the terms like “PMN” or “rush crush” quite often as she eagerly tells you about her first week of class. A sororityis a society for female students in a university or college. Sorority recruitment typically occurs at the beginning of the semester, and students join for all sorts of reasons. She will definitely be excited to strut her organization if she decided to “go Greek”. Each sorority has official colors, flowers, symbols, mascots and even jewels. Congratulate her on her decision by sending her sorority-inspired jewelry. We have provided a guide to help you figure out what to send! Pearls are a must-have. They are sophisticated, classy and versatile. Many sororities list pearls as their official jewel, and even those that don’t, still sport these elegant accessories. The classic pearl necklace is always a good choice because it complements practically every outfit. A pearl pendant or a pair of pearl earrings will really come in handy when she’s attending those formal events throughout the school year! Alpha Chi Omega, Delta Delta Delta, Delta Sigma Theta, Alpha Xi Delta, Chi Omega, Sigma Kappa, Alpha Gamma Delta, Kappa Delta, Sigma Sigma Sigma, Alpha Sigma Tau, Alpha Epsilon Phi, Theta Phi Alpha and Delta Phi Epsilon. 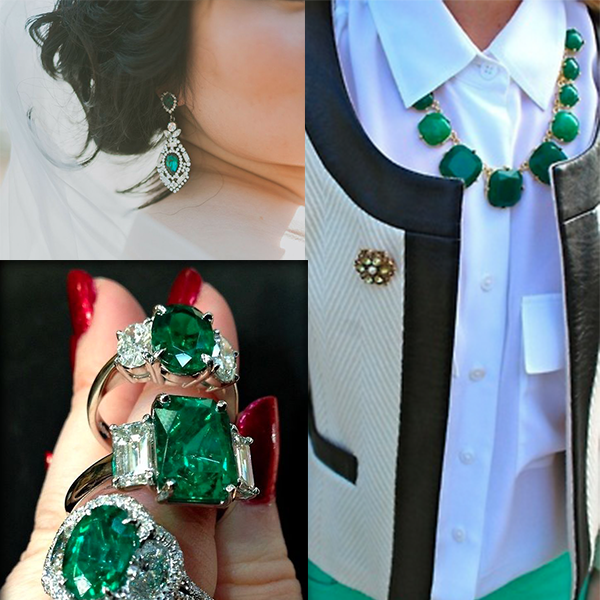 Emerald’s rich and classy hue has been frequently spotted on the red carpet lately. The best thing about emerald green is that it can flatter anyone, regardless of skin tone, hair color or even personal style! It’s also very versatile. The opulent jewel tone looks remarkable with countless other hues in your closet. An emerald statement necklace is a great start to her jewelry collection! Seeing as sapphire is the birthstone of September, now is the perfect time to discover its beauty! Add a dazzling effect to her sophisticated fashion ensemble by getting her a stunning pair of sapphire earrings. They especially standout with an up do. Kappa Kappa Gamma, Theta Phi Alpha and Phi Sigma Sigma. iendship bracelets, or using them to accentuate a stunning gemstone. You can never go wrong with a pair of diamond stud earrings. They complement an elegant dress, but they also look perfectly fine with jeans and a V-neck. A simple diamond bracelet makes a great addition to a bracelet stack. Take a look at our guide to learn more about this stacking trend. Alpha Xi Delta, Chi Omega, Delta Xi Phi, Alpha Delta Pi, Delta Zeta, Lambda Psi Delta and Kappa Delta. The striking color of a ruby is very eye-catching. From necklaces to bracelets, rubies add passion and sophistication to an outfit. A cool way to incorporate ruby rings is to stack them. Ring stacking is a popular trend, and you can read all about it in our post about The New Norm. If she isn’t much of a ring-wearer, a stunning ruby bracelet will definitely make a statement at her next sorority event! A large part of growing up is style development. With these beautiful trinkets, your daughter’s sophisticated jewelry collection will be off to a stylish start. Now you’ll be able to easily find gifts that match her sorority’s official jewel. Don’t see her sorority on the list? Mention it in the comment section and we’ll add it!